VERY FINE. AN EXCEPTIONAL PAIR OF THE QUEEN VICTORIA 10-PENCE O.W. OFFICIAL. A MAJOR OFFICIAL MULTIPLE RARITY OF WHICH NO MORE THAN 40-60 UNUSED EXAMPLES ARE THOUGHT TO EXIST. The rarity of this denomination in unused condition is due to two factors. First, the Office of Works was a very small department. Over the course of eight years, only £1,541 of stamps were overprinted with an estimated one 10p used a day. 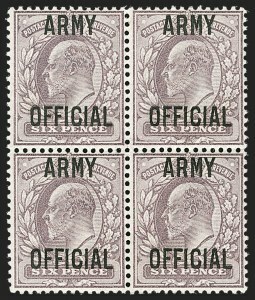 Only 720 10p stamps were overprinted with no more than 560 placed in use (due to registration sheet, "Specimens", etc.). Second, most unused examples are believed to emanate from the sheet of 80 taken by W.J. Richards in May 1903, which he thought were obsolete. Half were returned by a co-conspirator, leaving 40 plus a few more for collectors. Wiseman considers a mint single comparable in rarity to the £1 I.R. Watermark Orbs, despite the significant difference in market value. Ex Baillie. With 1982 R.P.S. certificate. SG as two singles £14,500. VERY FINE. 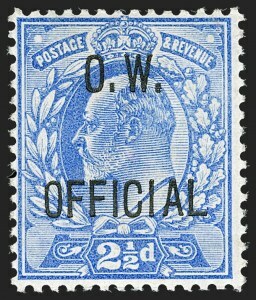 A SURPRISINGLY SCARCE EXAMPLE OF THE 2-1/2-PENCE KING EDWARD VII O.W. OFFICIAL. EXTREMELY FINE AND PRISTINE EXAMPLE OF THE 10-PENCE KING EDWARD VII O.W. OFFICIAL. ONE OF THE RAREST DEPARTMENTAL OFFICIALS, ESPECIALLY IN THIS SUPERB CONDITION WITH SHEET SELVAGE. According to records, only 14 sheets of 96 were printed. When taking into account the necessary registration sheet, "Specimens", used examples and those returned after the end of use, the potential supply of unused examples was extraordinarily small. 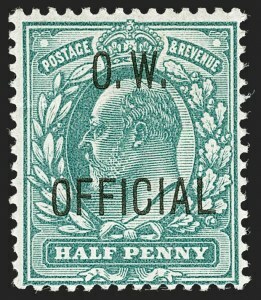 The short span of use also contributed to its rarity, as the earliest known use is from July 1903 and sales ceased in May 1904. 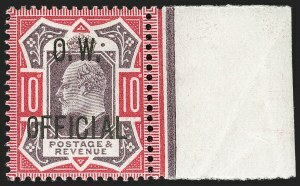 While the 10p Queen Victoria had a lower printed quantity, unused examples are more available due to the 40 unused examples that entered the market from the W.J. Richards half-sheet. A definite count of genuine unused examples is difficult to make, due to the prevalence of fakes, some of which have previously received genuine certificates. Wiseman, along with an Official specialist, concluded that of 90 used examples submitted over the course of 15 years, only 12 were genuine. VERY FINE AND RARE BLOCK OF THE 6-PENCE KING EDWARD VII ARMY OFFICIAL. THIS IS THE LARGEST KNOWN MULTIPLE WITH ONLY ONE OTHER BLOCK THOUGHT TO EXIST. According to an Official specialist, two blocks of four are known, with the next largest multiple a strip of three. Following the Inland Revenue (I.R.) 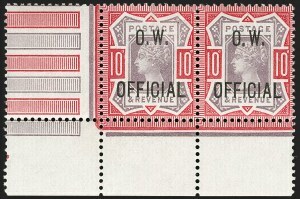 overprints, requests were made by other government departments for their own overprinted stamps. The Army, along with Office of Works, were rejected in their attempts at first. The Post Office would not supply the stamps free of charge. A case was made to the Treasury and a compromise was molded whereby the stamps were to be purchased straight from the printer.